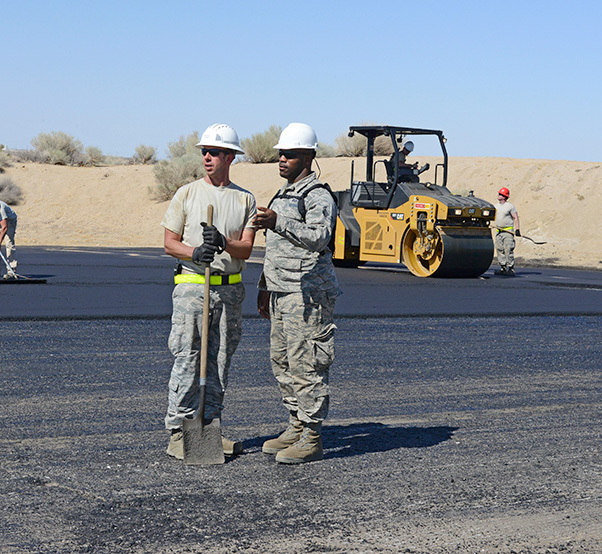 Civil engineer Airmen lay asphalt in front of Club Muroc as part of a complete repaving project. More than 80 Airmen from across the nation joined 412th Civil Engineer Squadron personnel to complete three large construction projects at Edwards. 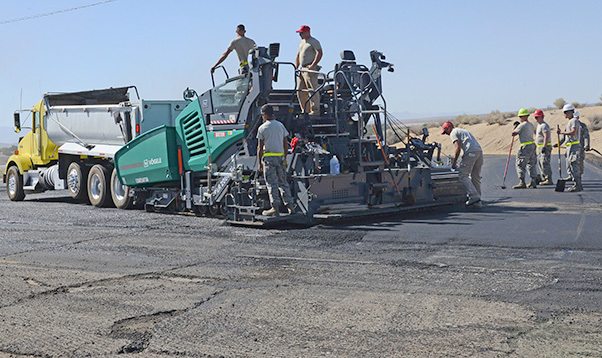 More than 80 Airmen from across the nation joined the 412th Civil Engineer Squadron at Edwards Air Force Base, Calif., to complete three large construction projects at Edwards. The projects allowed the Airmen, mostly from Air Force Reserve Command and Air National Guard, to get hands-on training during their annual two-week-long drill while the 412th CES provided expertise and equipment. The results are newly paved parking lots for Club Muroc, an underground drainage system by base housing, new gaskets installed in hangars and renovations to Bldg. 4906. Senior Master Sgt. Rebeca Forgey, 446th Civil Engineer Squadron, Washington, was the project manager. She met Murray Westley, 412th CEG director, while she was attending an Airman Leadership School graduation here for one of her troops. After a short talk, her squadron got ready to take on the mission. 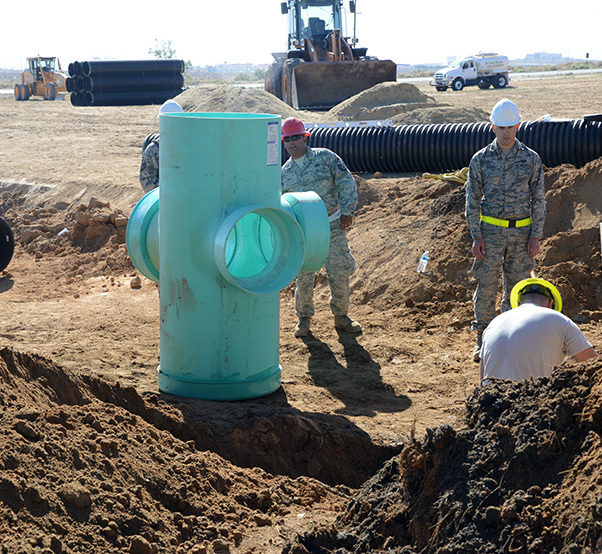 Civil engineer Airmen with the help of 412th Civil Engineer Squadron personnel install an underground drainage system by Kincheloe Ave. near base housing. 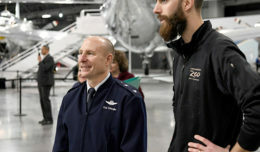 Forgey called AFRC headquarters and said the Edwards project was a much larger scope than her squadron could provide and asked for volunteers, who stepped up right away. She added that 81 civil engineer Airmen is a lot to have at one time, but because Edwards is large and the projects were spread out, they managed to get a lot done in a small amount of time. In addition to repaving the parking lots at Club Muroc, the CE Airmen also relocated an electrical line underground beneath the main parking lot. The underground drainage system project took place near Kincheloe Ave. by base housing. “The (previous) open drainage had lots of issues with it filling up with debris and causing backfill and flooding so we cleared it out and put in 27-inch piping and then covered it so it will be underground. It should help with the debris build-up in there,” Forgey said. Another team worked on renovating 412th Civil Engineer Group’s Bldg. 4906 where they did reframing of office spaces and walls, electrical work and all the plumbing was completely renovated, according to Forgey. 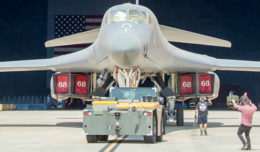 In total, eight Air Force civil engineer squadrons banded together with Edwards CE personnel to complete the projects in two weeks. 482nd Civil Engineer Squadron, Homestead Air Reserve Base, Fla.
439th Civil Engineer Squadron, Westover Air Reserve Base, Mass. 512th Civil Engineer Squadron, Dover Air Force Base, Del. 203rd Rapid Engineer Deployable Heavy Operational Repair Squadron Engineers (RED HORSE), Va.
434th Civil Engineer Squadron, Grissom Air Reserve Base, Ind. 201st Rapid Engineer Deployable Heavy Operational Repair Squadron Engineers (RED HORSE), Penn.